Yesterday I came home and drove into the drive way, I pressed the garage door opener and to my surprise, the garage door would not open. I pressed the button several times and it still would not open. I went into the house and none of the lights would turn on. I called Pepco and found that our neighborhood was experiencing a power outage. It was around 4:00 PM and they told me that the power would not be on until around 8:00 PM. Just like we depend on electricity to work every time we press a button or turn on a switch, there are times when we have the same attitude in our relationships. We expect our spouses, kids or our parents to act a certain way but sometimes we are disappointed. Have you ever went to someone for love but you didn’t get it? Perhaps it was a spouse, a parent or a friend. Maybe it was at a time when you really needed some love but it wasn’t there. The person who you thought you could depend on, was not there or available. This is a hurting and a disappointing feeling. In honor of Valentine’s week (Happy Valentine’s Day! ), I want to remind you of a love that you can always depend on. 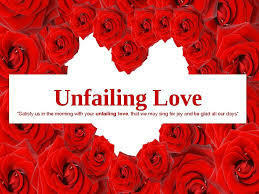 This is an “Unfailing Love” that comes from our “Unfailing God.” Every time I think about God’s love for us, I get excited! He loves us with an “Unfailing Love.” Unfailing is defined as not falling short of expectation, completely dependable, inexhaustible, not failing and endless. So no matter what you may be going through, you can have hope and encouragement because of God’s “Unfailing Love.” Although we fail, let’s keep striving to imitate God and offer “Unfailing Love” to our spouse, children, family, friends and those who God brings in our path. I Corinthians 13:7 says Love never gives up, never loses faith, is always hopeful and endures through every circumstance.